The Republic of South Africa ceased to be a member of the British Commonwealth of Nations and became an independent republic in 1961. After 1994 it rejoined the Commonwealth. 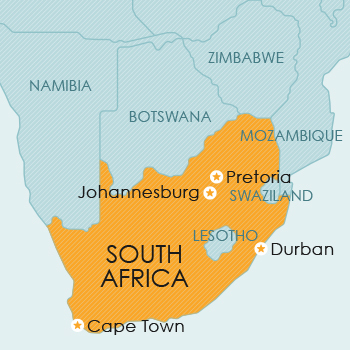 South Africa lies at the extreme southern tip of the African continent, bordered to the north by Namibia, Botswana and Zimbabwe, and on the northeast by Mozambique. South Africa is a member of the Paris Convention and the WTO/TRIPS. South Africa is expected to accede to the Madrid Protocol within the near future. The Act provides for the registration of trade marks in respect of goods and services. It is important to note that registration of a trade mark does not necessarily confer an absolute right to use the mark. Prior rights, recognised by law, to a mark may have been secured in ways other than by registration, eg by use. The protection afforded by a trade mark registration extends to the use of an identical mark or a mark so nearly resembling it as to be likely to deceive or cause confusion, in relation to identical goods or services, or goods or services which are so similar that a likelihood of deception or confusion exists. South Africa is a member of the Paris Convention, the Budapest Treaty, the PCT and the WTO/TRIPS. Patent protection is obtainable by way of a national filing, or via a PCT filing. A national filing can be in the form of a provisional application or a complete application, and the complete application can be a non-convention or a convention application. A patent confers on the patentee for the duration of the patent (ie as long as it is maintained in force by the payment of renewal fees), the right to exclude all other persons in South Africa from making, using, exercising, disposing of or offering to dispose of, or importing the patented invention, so that the patentee shall have and enjoy the whole profit and advantage accruing by reason of the invention. The sale in South Africa of a patented article by or on behalf of the patentee gives the purchaser the right to use and dispose of that article. South Africa is a member of the Paris Convention and the WTO/TRIPS. It is expected to accede to the Hague Agreement in the near future. Design protection is obtained by the filing of an application for the registration of a design. The effect of a design registration is to grant to the registered proprietor the right, for the duration of the registration, to exclude other persons from making, importing, using or disposing of any article included in the class in which the design is registered and embodying the registered design, or a design not substantially different therefrom, so that the registered proprietor shall have and enjoy the whole profit and advantage accruing by reason of the registration. The disposing (in South Africa) of an article embodying a registered design by or on behalf of the registered proprietor gives the purchaser the right to use and dispose of that article. South Africa is a member of the Berne Convention and the WTO/TRIPS. A work (except a broadcast or programme-carrying signal) is not eligible for copyright unless it has been written down, recorded, represented in digital data or signals, or otherwise reduced to material form. The requirement of originality has been interpreted by the courts to mean that the author must have expended creative effort, labour and skill in creating the work. South Africa is a member of the UPOV Convention for the Protection of new Varieties of Plants, and the WTO/TRIPS. Protection by way of a plant breeder’s right may be obtained in respect of new varieties of certain ‘kinds of plants’ by filing an application for registration (see the section on Application below) under the Plant Breeders’ Rights Act. stocking for any of the above purposes. varieties the production of which requires the repeated use of the protected variety. The protection may also be extended by notice in the Government Gazette to products made directly from harvested material of a protected variety.